A mate gave me this framed picture that hangs in my workshop wondering if anyone knows the history ? Last edited by Ian_B on Thu Dec 14, 2017 10:50 am, edited 1 time in total. If you Google BLA523 you'll see some more great images of this BMC Works car in action, often driven by Evan Green, PR Manager at BMC Australia at that time. 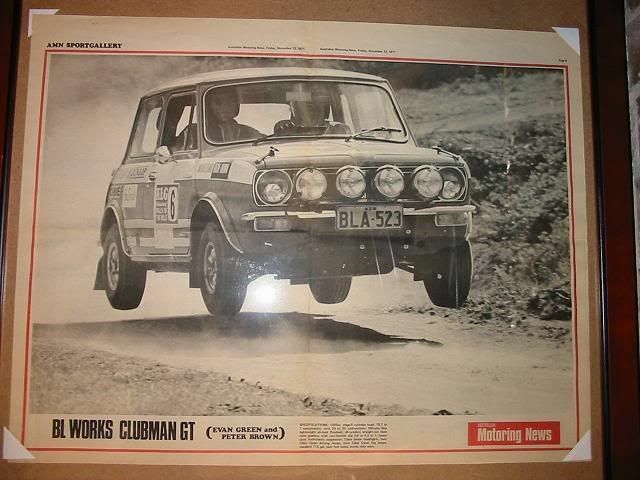 That shot is from the Rally of NZ in 1971. YMO881H was registered in Australia as BLA523. It was crashed, maybe in NZ. It was rebuilt into the Australian Clubman GT shell as shown in the picture below of Evan Green driving it in the Southern Cross Rally in 1971. It's a great photo that one, with all four wheels off the ground. P.S. I deleted the duplicate post. Last edited by 9YaTaH on Thu Dec 14, 2017 1:18 pm, edited 2 times in total.